People are taking notice of Betty Nash’s art. Her works, done in oil, are graceful, subtle manipulations of light and shadows, of deep colors and reflections. She uses the chiaroscuro style (the play of light and shadow) embraced by masters such as Rembrandt and Raphael. “I set up objects in front of me. I have a north light studio. Light constantly hits what I’m painting. I look at how the color of each object reflects into another…and push, or brighten the reflection,” she said. The native Texan has had an interest in the arts as long as she can remember. She made a career painting classical realism and commissioned portraits. “I painted portraits, landscapes and other genres,” she recalled. “About six years ago, I was outside painting trees, and with every stroke I thought, ‘I hate painting trees’.” She hasn’t painted one since. She also dabbled with other mediums but in the 1980s settled on oils. “After my children were grown and I could leave oil paint out is when I decided to use nothing but oil. It’s richer than any other medium,” she said. 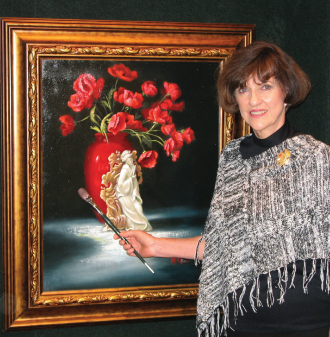 She has been featured in International Artist Magazine as one of the “Master Painters of the World,” and American Artist magazine judged three of her paintings as outstanding. Though praise is nice, it isn’t what prompts her to pick up her brushes. The love of art does. “If I never sold another painting, if no one else ever saw what I did, I would still get up and be excited to start painting every day,” she said. Betty Nash’s work can be seen at The Pat Waymon Gallery, 430 W. Main St., Denison, TX 75020 (903) 465-2008, Hours: Mon-Sat 10 a.m.-5 p.m. or visit online www.paywaymongallery.com or online at www.bettynash.com. Three heads, the torsos nowhere nearby, lie lined up on a bed in a small silver traveling trailer in a North Texas parking lot. Noggins from a child, an adult, and a senior citizen stare glassy eyed and grinning at anyone who walks in. This might be unsettling to some folks. For Tim Cowles it is another day at work.